We are making a space for some of Yellow Springs' youngest students to learn at Agraria! Everyone at Community Solutions is looking forward to this summer, when the Yellow Springs Community Montessori Cooperative will host a work/play program for its energetic learners, ages 3-6. A design for their outdoor classroom/playground is underway, and when finished it will serve all the children who visit Agraria, not just the Montessori participants. Not long ago, a few Community Solutions staff members were out in the chosen area--just behind the new offices, at the edge of a honeysuckle-infested woods. 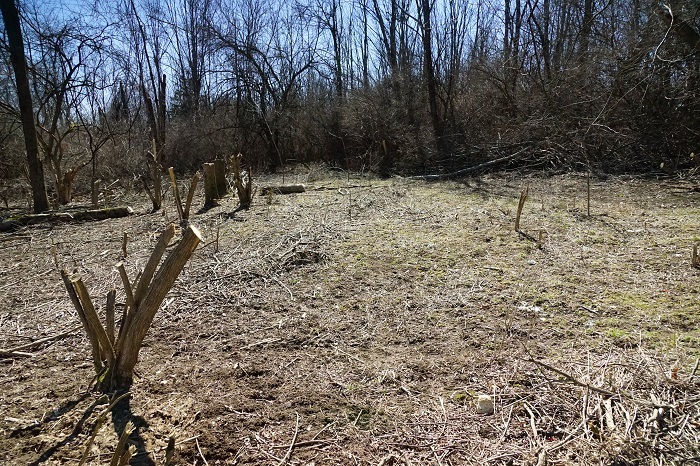 With some chainsaws, sunshine, and the vision of Antioch Miller Fellow Gabby Amrhein, the extensive clearing work got off to an enthusiastic start! If you'd like to help, come out and join us (and some terrific Montessori parents) on April 3. See the event page for more information, and thanks for all your support!